Presumptive Republican nominee Donald Trump officially announced Indiana Gov. 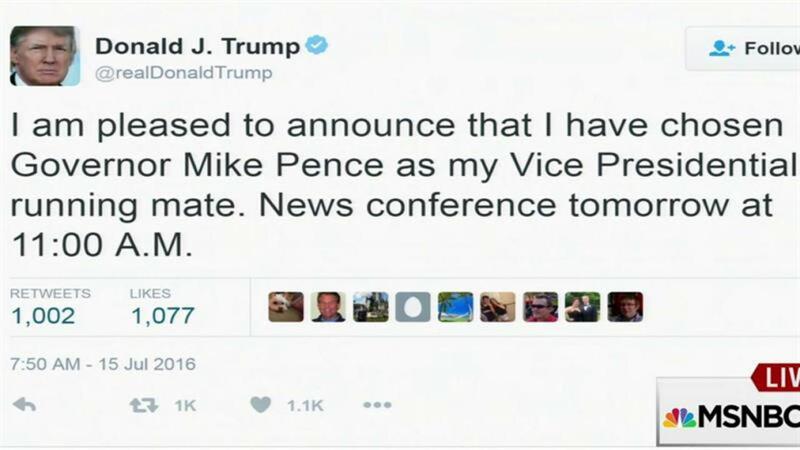 Mike Pence as his vice presidential running mate Friday morning. The outspoken billionaire tweeted the news, adding that there would be a news conference Saturday at 11 a.m. The news initially leaked on Thursday afternoon with an official announcement scheduled for Friday morning. However, Trump postponed the event after the deadly attack in Nice, France, that left more than 80 people dead. Republicans close to the campaign said earlier this week that the mogul had narrowed his shortlist to Pence, former House Speaker Newt Gingrich and New Jersey Gov. Chris Christie. Despite the news leaking, Trump attempted to keep the suspense alive, telling FOX News' Greta Van Susteren, "I haven't made a final, final decision." Pence is a popular figure among conservatives with the potential to unify a divided Republican party. Before the news broke on Thursday, Speaker Paul Ryan praised his former House colleague, saying, "I'm a big fan of Mike Pence's. We're very good friends. I have very high regard for him." The 57-year-old legislator spent 12 years as a U.S. congressman before taking on the gubernatorial role. He came under national scrutiny in 2015 after signing the Religious Freedom Restoration Act into law. Critics claimed the law permitted discrimination against LGBT individuals. Presumptive Democratic nominee Hillary Clinton was quick to respond to the news, tweeting a scathing video criticizing Pence's record as governor.